We’re getting closer to our technology. We put it in our pockets now. Martine [Rothblatt] and I are working on a project to put it into your clothing to monitor your health. They’re already beginning to go into our bodies and brains in this very early stage, but that’s going to accelerate. 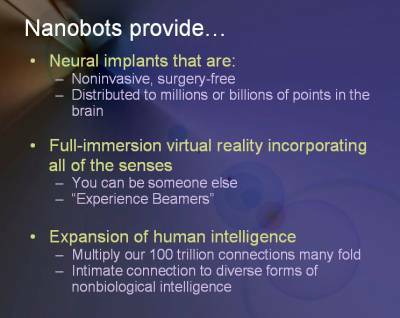 We have nanobots  that are quite sophisticated already in terms of being able to perform therapeutic functions. If you add a billion fold increase of capability and a hundred thousand decrease in size to what we can do today, then by 2029 these will be quite sophisticated and they’ll be going inside our human body, keeping us healthy from inside. They’ll also be going inside our human brain, interacting with our biological neurons, creating full immersive virtual reality from within the nervous system, expanding our memory and our cognitive capabilities. You’re going to be hard pressed to find a human who isn’t enhanced in some way by technology. And once it gets a foothold in our bodies and brains it’s going to be subject to this law of Accelerating Returns, which is just doubling our capabilities, not because it’s self-replicated, but just because that’s the nature of information technology. We have ten to the twenty-sixth power calculations per second in the whole human race today, by my estimate. Fifty years from now that number’s going to be ten to the twenty sixth power. Biological capability is pretty much fixed. The population might increase but that’s not going to change that figure. The non-biological intelligence is going to intersect with that in the 2020s, and ultimately will become far more powerful. Most of the action in our brains at some point in the 2030’s or 2040’s is going to be non-biological. And obviously non-biological intelligence is much more subject to uploading. It’s not going to be the case that in 2045 we will have a fully biological human that we just try to upload. People will already be different by that time. 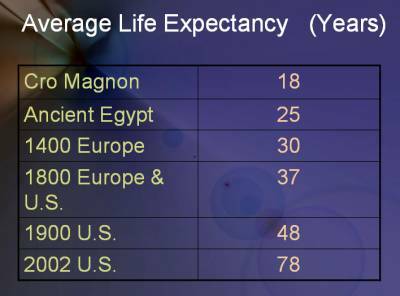 Human life expectancy is increasing, and I don’t want to dwell on that, but one of the implications is that it’ll go into hyper drive once we get into the mature process of reprogramming our biology. Then we’ll also be able to expand beyond the limitations of biology with this intimate merger with nanotechnology. I just touched for 60 seconds on the criticism that exponential trends can’t go on forever. I’ll also address a big criticism, that hardware is definitely increasing exponentially but software is not. I’ve got many examples, not only individual anecdotal examples on how software is improving, but on that there are many different ways to measure it. I don’t have much time left but I’ll mention one that’s very good. Take chess machines. People think that’s just hardware driven - just computers getting more powerful therefore they can deal with the exponential combinatorial explosion of move-countermove sequences to greater effectiveness. But there is a pattern recognition decision that needs to be made, because you can’t expand a tree of move-countermove possibilities forever. At some point you have to decide to cut off one of those trees of expansion. And, in fact, you have to do that constantly. That’s a pattern recognition task. Now, you can do that simply by counting up piece values, and that’s what was done in the early stages, but the chess machines have applied more and more sophisticated pattern recognition to that decision. Chess machines got better and better. I predicted that a computer would take the World Chess Championship in 1998. I did that in the 80’s: it happened in ’97. Yet that was basically from hardware improvement, because these chess supercomputers were getting more powerful each year, adding 40 points to chess score. Chess score is a very wonderful quantitative logarithmic measure of intelligence within that domain. IBM cancelled the supercomputer in ’97 because there was much less interest in chess, so then we had this big drop in computation as we switched to using PC’s. Recently, Deep Fritz  running out on a few PC’s had the same amount of computation as Deep Thought , a chess supercomputer in 1988. They both could do four million board positions per second- they had equal hardware. The difference between them was not because one had more hardware capability than the other, the PC’s today are equal to the supercomputer of 18 years ago. Yet Deep Fritz has 400 points more than Deep Thought. Another way to think about it is that it matched Deep Blue , despite the fact that it has only one percent as much hardware capability. So, if you follow that, it’s a quantitative demonstration of smooth exponential progression in the quality of the software in this pattern recognition domain. I have many other examples like that in the book. 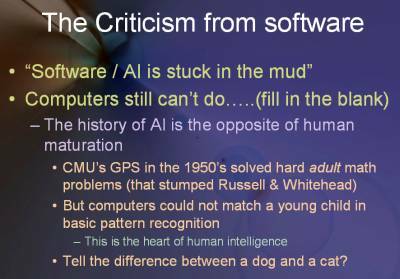 Software is not stuck in the mud; there’s many ways to measure it; and you can also look at things like ability to simulate the brain and reverse engineer aspects of it which is also scaling up exponentially. As I mentioned earlier, we will have to understand how the brain works. We could in theory say you don’t have to do that in order to do brain uploading; you could just blindly copy every little module at a micro level. I don’t think that’s feasible. You need to know what is going on to know what to look for. We’re finding in some neurons it’s the concentration of certain neurotransmitters that matters, in other ones it’s the location of certain neurotransmitters- whether they’re near a certain ion channel or not. We need to understand how these mechanisms are working to be able to know what to reverse engineer, to the extent that we’re trying to copy intelligently biological subsystems. 2. Deep Fritz - Fritz is a German chess program developed by Frans Morsch and Mathias Feist and published by Chessbase. There is also a version called Deep Fritz that is designed for multi-processing. 3. Deep Thought - a computer designed to play chess. It was second in the line of chess computers developed by Feng-hsiung Hsu, starting with ChipTest and culminating in Deep Blue. Deep Thought was easily defeated in both games of a 2-game match with Kasparov in 1989 as well as in a play by email match with Michael Valvo. It was named after Deep Thought, a fictional computer in Douglas Adams' series, The Hitchhiker's Guide to the Galaxy. 4. Deep Blue - a chess-playing computer developed by IBM. On 11 May 1997, the machine won a short 6 game exhibition match (not a world title match) by two wins to one with 3 draws against world champion Garry Kasparov after Kasparov made a remarkable blunder (for a world chess champion) in the opening of the last game. Ray Kurzweil, Ph.D. is a best-selling author, inventor, entrepreneur, futurist, and movie producer. In 1999, he received the National Medal of Technology for pioneering and innovative achievements in computer science serving to enrich the lives of many disabled persons. For additional information, please visit www.kurzweilai.net and www.singularity.com.